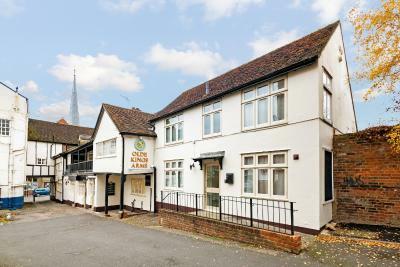 Lock in a great price for The Olde Kings Arms – rated 8.6 by recent guests! 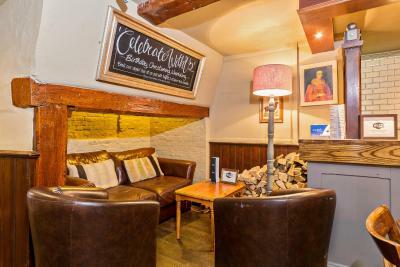 Cosy friendly pub with great accommodation attached. Super comfy bed, excellent breakfast and lovely staff. The server in the restaurant was very nice! We enjoyed having breakfast with her there. Good friendly service. Breakfast included. Central location. The room was cosz and comfortable, the venue and garden was really good, The garden came in to it's own in the glorious sunshine we had the weekend I stayed. The food was really good. 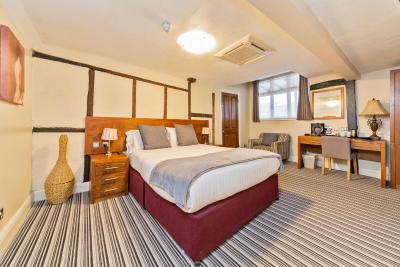 The staff was friendly and very helpful, our room was clean and comfortable and the old town of Hemel Hempstead was very quaint. We enjoyed our stay! Staff were really friendly and great with the kids and dogs (2 of each!) in our group. Very accommodating too, making some changes to small things as needed since we were a large group. Thanks for looking after us so well, we'll be back and recommending you! The staff was extremely friendly, helpful and efficient! Allowing us to put our dinner and bar tab on our room bill was also an added helpful feature! Breakfast was tasty and a good way to start each day! Room #8 was recently renovated and had a large shower with good water pressure. This establishment is really an authentic old pub! Staff were super friendly and room 6 had great character. Location wasn't far from the airport. 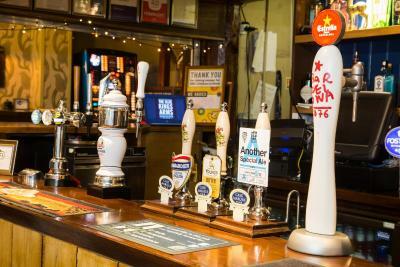 The staff were very kind and and location of the establishment was perfect; made my trip to England a great experience. Staff very friendly and helpful. Breakfast was outstanding and fresh. Room and rest of building tidy and well kept. 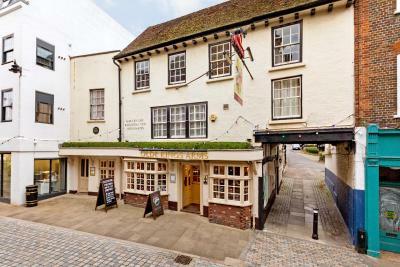 Located in the old town of Hemel Hempstead, the Inn is opposite the Old Town Hall Theater and St Mary's Church and only 1-minutes' walk from Gadebridge Park. 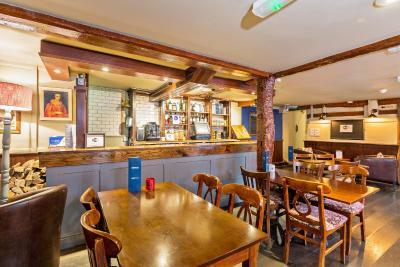 The Olde Kings Arms is conveniently located for fast trains into central London, as well as being only 8 minutes from the M1 and M25 motorways. 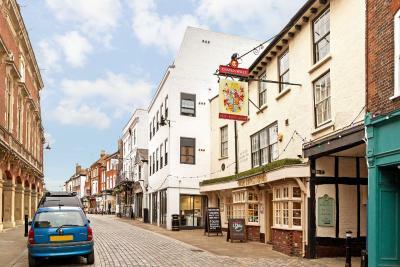 The great access to the region’s major road and rail network makes it a great base for visiting the city on business or for exploring the surrounding region for leisure. 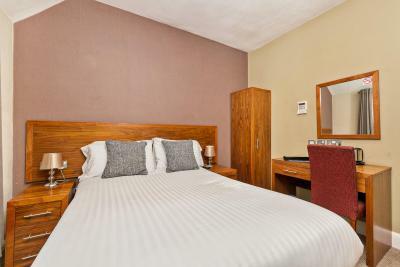 The comfortable well-equipped accommodations has everything you need in a relaxing base, including multi-channel flat-screen TVs and WiFi in all rooms and communal areas. 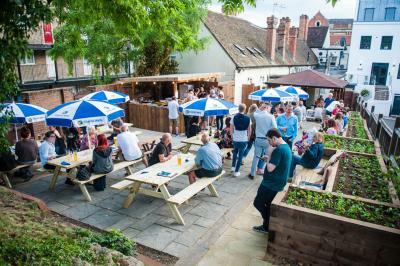 The hotel has a garden and 2 bars offering a selection of real ales and fine wines. 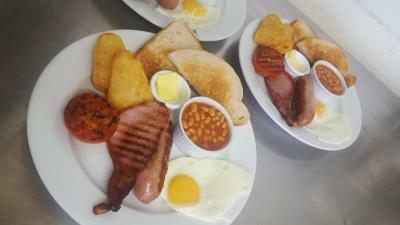 A full English breakfast is available every day and is included in the room price. 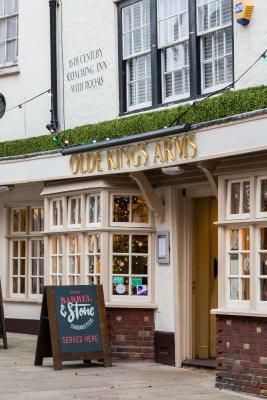 When would you like to stay at The Olde Kings Arms? 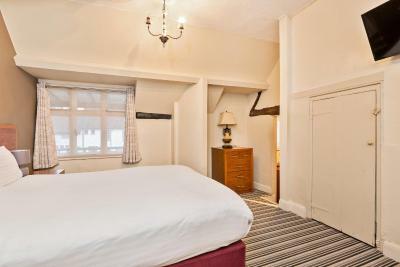 These rooms have direct access to the pub, as well as a door to the street allowing guests to come and to go as they please. 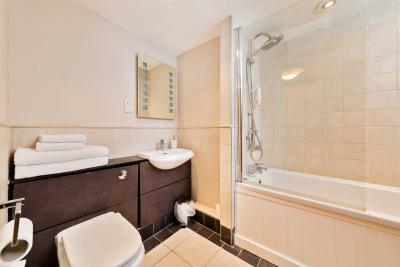 Also featured is controlled heating and air-conditioning, showers, towels and tea/coffee making facilities. 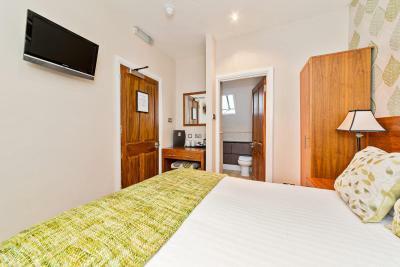 This twin room is located at the rear of the building and is easily accessed directly from the street. 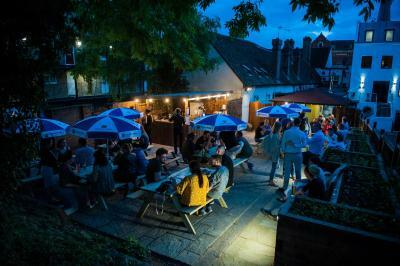 As well as direct access to the pub, there is also a door to the street allowing guests to come and go as they please. 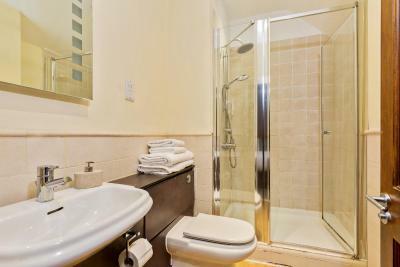 The twin room has a large wet room type shower and wider door to allow access for wheelchairs. Also featured is controlled heating and air-conditioning. 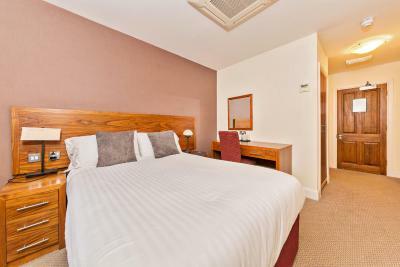 The large superior rooms are located in the older part of the building dating back to the 16th century. 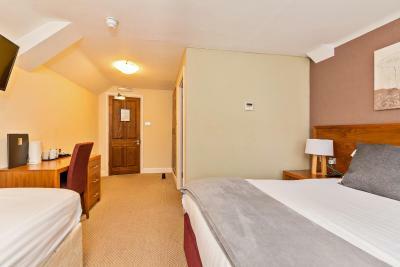 These rooms are twice the size of the standard rooms as well as benefiting from larger bathrooms and iron and ironing board. 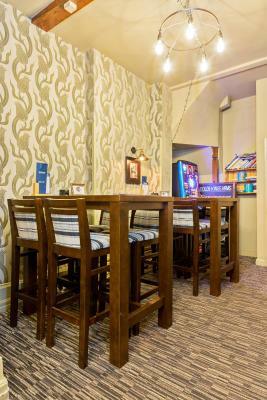 As well as direct access to the pub, there is also a door to the street allowing guests to come and go as they please. Also featured is controlled heating and air-conditioning. The family room has one large double bed and one single bed. It is located to the rear of the building away from the main pub yet enjoys direct access to the pub and also has street access so guests can come and go as they wish. There is also air conditioning in this room. The suite sleeps up to 5 people. 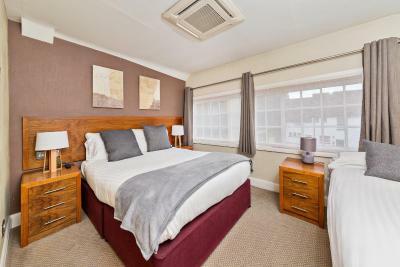 A secondary room off the main bedroom has a double and single bed and the main room has a large double bed which can also be made into two singles upon request. The main room also has a dining table seating 4 and a sofa seating area. There is also a small kitchen area with fridge and microwave. 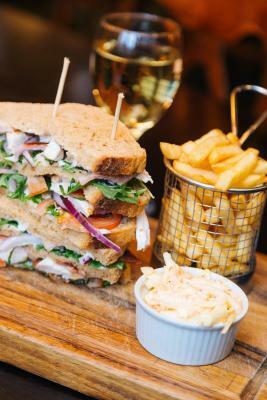 House Rules The Olde Kings Arms takes special requests – add in the next step! The Olde Kings Arms accepts these cards and reserves the right to temporarily hold an amount prior to arrival. please note the property caters for functions and meals are not always available. 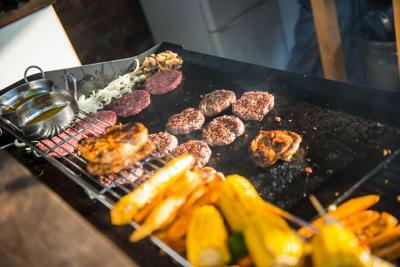 Guests who wish to dine on site are advised to contact the property in advance. First room was not comfortable I nearly left and rebooked elsewhere. 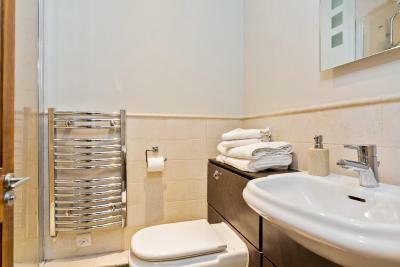 Not very clean bathroom and electric towel warmer seemed a bit dangerous very hot when on. Tiny wall mounted tv. People standing outside window very late whilst smoking from bar. Changed rooms to upper floor that bathroom shower was terrible, the controls were loose and very hard to set. Again bathroom not very clean. 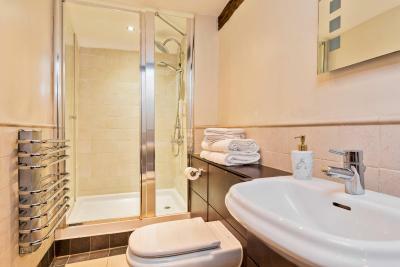 Whole accommodation needs really good clean into corners and showers need overhauling. No hairdryer in both rooms. 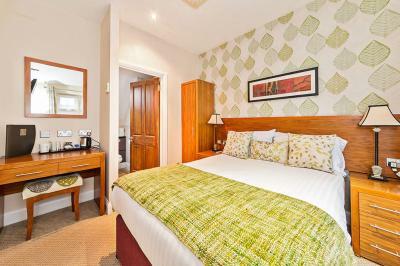 The location was brilliant, the room was clean and tidy and the staff were excellent. Awesome place, amazing staff and great value for money! Only point - and not a criticism, would have been handy to know that food wasn’t served on a Sunday evening, but staff were happy to recommend good restaurants close by. Comfy bed. Friendly staff. Tasty breakfast. Everyone keen to help and really pleasant atmosphere. Bathroom could do with a touch-up. Wifi was working poorly at times. A few spider webs in the corner of the room but nothing too bad really. Cozy and very comfortable bed. Lovely locations with a traditional pub and restaurant. Great tasting food and good selection of beers. Staff was really friendly. Excellent location- very quiet and seems to come to life at night - very friendly and a super comfy bed - loved Cochin restaurant also a stones throw away. Brilliant shower too! Our room was fantastic and the location is superb. I’d especially like to give a massive shoutout to the staff - we made friends with one of the staff members (epic lady with white hair and glasses) and she was the highlight of our stay. She helped us a lot to arrange everything and was a superb companion for chatting during dinner. I’ll definitely visit again, thank you for everything! They welcomed us really good and they spoiled our dogs even the locals were brilliant. The bed was comfortable and the bath towels were massive and fluffy. The staff were friendly and nothing was to much trouble for them. 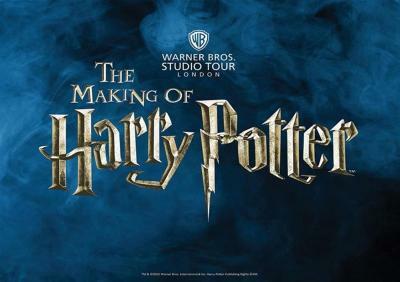 We will definetly go back again. Parking don't great. but then it is on high street. Great Pub. Staff were very welcoming. Would happily stop again.